04.17.2014 - Skylar Tibbits will be giving a lecture at Harvard GSD April 17th 1pm as part of the Adaptive Design Series. 01.2014 - A new public art project comissioned by the Cambridge Arts Council will be opening Jan 27th at the Cambridge City Hall Annex. 01.2014 - Skylar Tibbits will be speaking at MIT Technology Review's Emtech Singapore Jan. 21st at the Marina Bay Sands. 01.2014 - Skylar Tibbits and Autodesk Inc. will be co-teaching a course at the Singapore University of Technology and Design. 12.2014 - Skylar Tibbits has been featured in the "Next Progressives" series by Architect Magazine. 12.2014 - Skylar Tibbits has been featured in the "Fellows in the Field" series created by TED. 12.2013 - Skylar Tibbits will be presenting at Autodesk University 2013 in Las Vegas. 10.2013 - Skylar Tibbits and Arthur Olson have recently exhibited a project titled, "Autonomous Mass Assembly" at the Calit2 Gallery at UCSD. 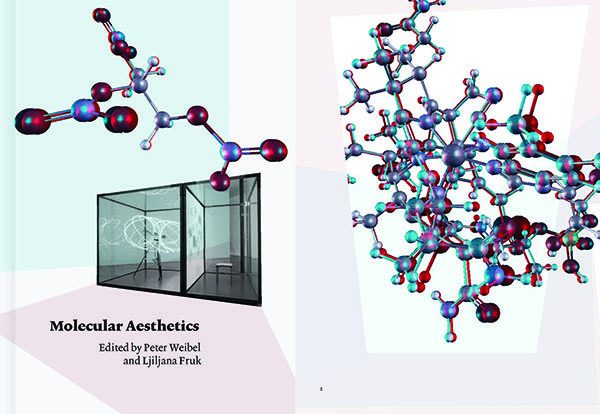 11.2013 - Skylar Tibbits and Arthur Olson have been published in, Molecular Aesthetics, a new publication by Peter Weibel and Ljiljana Fruk. 11.2013 - Skylar Tibbits has been interviewed by the Architecture League of NY as a winner of the League Prize. 10.2013 - Fast Company has produced a new video on the Self-Assembly Lab as part of their Change Generation series. 11.2013 - Skylar Tibbits will be presenting at MIT Technology Review's Emtech Spain Conference in Valencia. 11.2013 - Skylar Tibbits will be presenting at the Open Innovation Forum in Moscow, Russia. 10.2013 - 4D Printing has been featured in an article with Autodesk & Nike in WIRED UK's October Issue. 10.2013 - Skylar Tibbits will be presenting at the World Knowledge Forum in Seoul, Korea. 10.2013 - Skylar Tibbits will be presenting at MIT Technology Review's Emtech Conference at MIT's Media Lab. 09.2013 - Skylar Tibbits, Marcelo Coelho and FormLabs have been awarded the "Next Idea in Art and Technology Grant" from Ars Electronica. 09.2013 - Skylar Tibbits has been selected as a finalist for Fast Company's 2013 Innovation by Design Awards. 09.2013 - Skylar Tibbits will be speaking at the Re.Work Technology Summit, Sept. 19th, London. 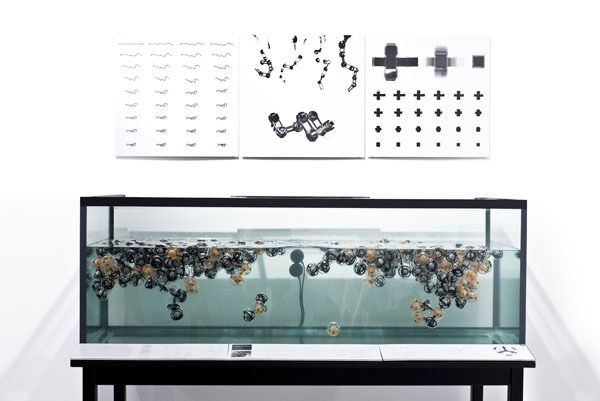 06.2013 - The 2013 Architectural League Prize exhibition has opened in NYC, including prize winner, Skylar Tibbits' project, Fluid Crystallization. 06.2013 - Skylar Tibbits will be presenting at the World Science Festival's Innovation Square event, NYC June 1st. 09.2013 - Skylar Tibbits will be participating in the upcoming ArchiLab exhibition, FRAC Centre, Orleans, France. 05.2013 - Skylar Tibbits has been named one of the Architectural League 2013 Prize winners. 05.2013 - Skylar Tibbits has received the "Visionary Innovation" award from the Manufacturing Leadership Summit. 05.2013 - Skylar Tibbits and Carlos Olguin will be presenting at the ICFF Design X event in NYC, May 21st. 05.2013 - A new 4D Printed prototype has been developed demonstrating a self-folding surface cube. 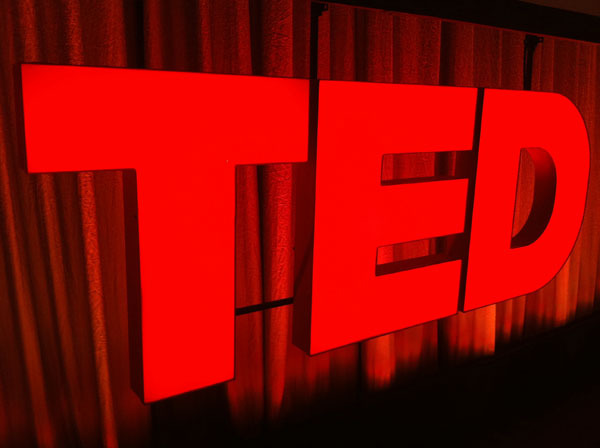 04.2013 - Skylar Tibbits' talk from TED Long Beach 2013 has been posted on TED.com. 05.2013 - Skylar Tibbits will be presenting at the Manufacturing Leadership Summit, in Palm Beach on May 14th. 04.2013 - Skylar Tibbits will be presenting at the Building Dynamics Symposium, in Banff, Canada on April 27th. 04.2013 - Skylar Tibbits will be giving a keynote at the U.S. Manufacturing Competitiveness Initiative on Additive Manufacturing at Oak Ridge National Lab, on April 19th. 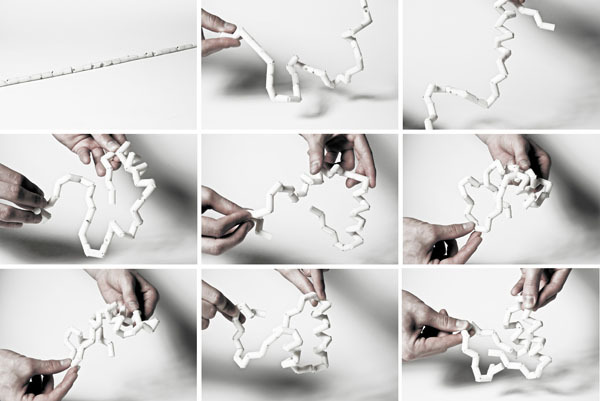 03.2013 - Skylar Tibbits will be presenting at the Science of Digital Fabrication Conference at MIT's Media Lab. 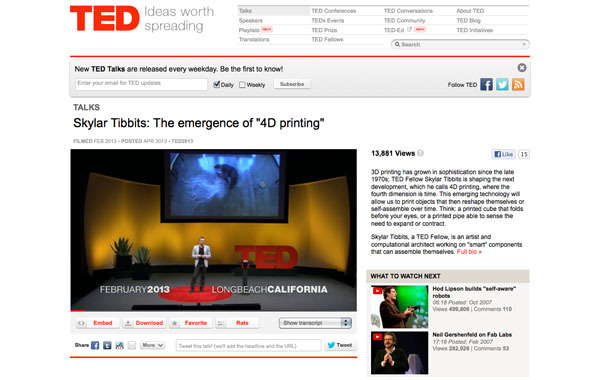 02.2013 - Skylar Tibbits will be presenting at TED 2013, unveiling a new collaboration with Stratasys, 4D Printing! 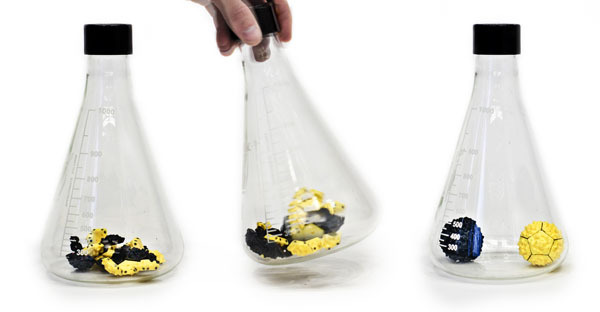 02.2013 - The Self-Folding Proteins project has been featured in WIRED UK's February Issue. 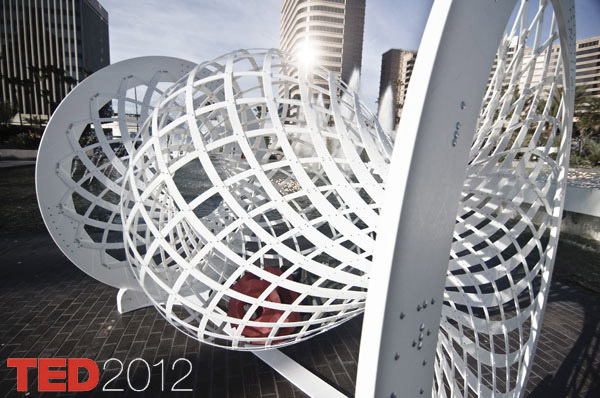 12.2012 - Skylar Tibbits and Arthur Olson, in collaboration with the Autodesk Gallery, have exhibited the Chiral Self-Assembly project at Autodesk University in Las Vegas. 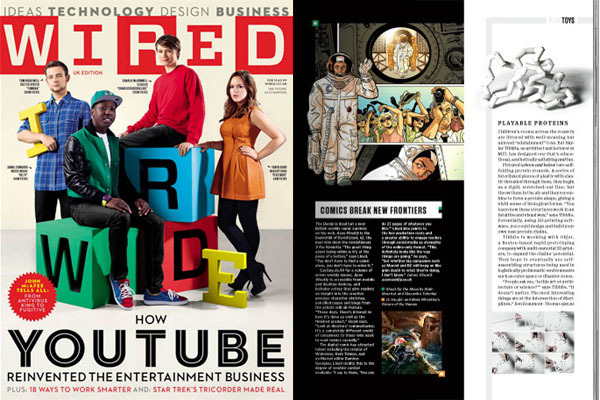 11.2012 - Skylar Tibbits has been featured in the special issue WIRED World in 2013: Guide to the Year Ahead. 11.15.2012 - Skylar Tibbits will be presenting with Simon Kim and Marian Ibanez at UPENN's PROOF: The Theme Year Lecture, Philadelphia, PA.
10.31.2012 - Skylar Tibbits will be presenting at the Open Innovation Forum during the Robots, Smart Systems and Digital Manufacturing session Moscow, Russia. 09.23.2011 - Skylar Tibbits has curated a short film on the MIT Architecture Department, exhibited at the Centre Pompidou in Paris France. The film was shot and produced by Stebs Schinnerer of Paper Fortress Films. 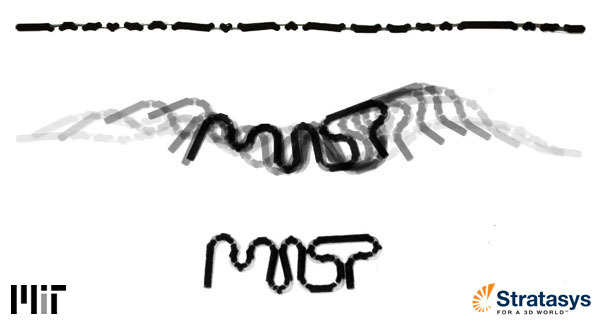 09.11.2012 - A series of Self-Folding Proteins have recently been developed to study macro-scale self-assembly systems. 10.26.2012 - Skylar Tibbits will be presenting as part of the Fluidity | Rigidity | Adaptability: Applied Jamming Conference, University of Chicago. 10.18.2012 - Skylar Tibbits will be presenting at ACADIA2012: Synthetic Digital Ecologies in San Francisco. 10.10.2012 - Skylar Tibbits will be presenting at Temple University's Beyond the Page event in Philadelphia. 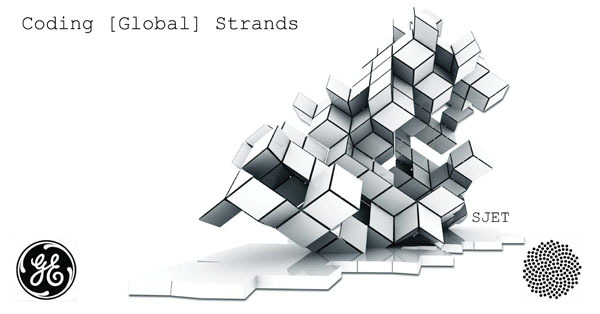 09.27.2012 - Skylar Tibbits will be hosting a workshop and exhibiting work at the Centre Pompidou as part of the Advances in Architectural Geometry Conference in Paris. 9.08.2012 -Skylar Tibbits will be giving a workshop on Growth Systems and Digital Fabrication as part of the coLab workshop series by modeLab, Sep 8th-9th NYC. Register here. 09.01.2012 - Skylar Tibbits will be presenting as part of the PROTO/E/CO/LOGICS 002 Symposium in Croatia. 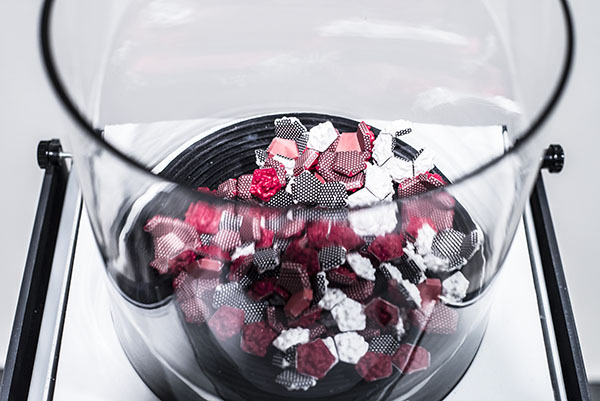 07.15.2012 - The BioMolecular Self-Assembly Project has been featured in articles in WIRED UK and the NewYorkTimes from coverage of this year's TEDGlobal conference. 06.25.2012 - Skylar Tibbits and Arthur Olson, in collaboration with Autodesk Research, will be exhibiting the BioMolecular Self-Assembly project at TEDGlobal 2012 in Edinburgh, Scotland. 05.9.2012 - Skylar Tibbits will be giving a workshop on Python for Rhino as part of the coLab workshop series by modeLab, June 9th-10th NYC. Register here. 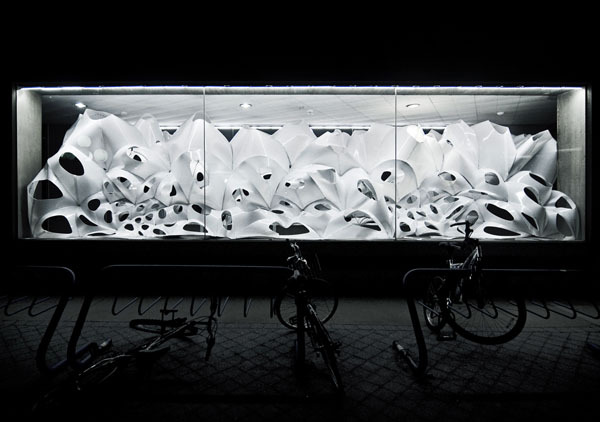 05.1.2012 - The May issue of NATURE Materials includes a review of Skylar Tibbits' article for AD: Material Computation, edited by Achim Menges. 04.16.2012 - Skylar Tibbits will be giving a lecture at The University of the Arts, Philadelphia, April 16th. 03.30.2012 - Skylar Tibbits is a contributing author for the latest publication of AD: Material Computation, edited by Achim Menges. 03.30.2012 - Skylar Tibbits, JJ Abrams, Bonnie Bassler and Robin Ince's TED talks will be aired on the Science Channel's new television series, TED Talks Science. 03.30.2012 - Skylar Tibbits will be presentating at NASA Ames on Self-Assembly for extreme environments. 03.27.2012 - Skylar Tibbits will be presentating at the Autodesk IDEAS: Innovation & Design Series, March 27-29th. 03.23.2012 - Skylar Tibbits will be presenting at the Lehigh High Performance Computing Conference, March 23rd. 02.27.2012 - Skylar Tibbits and Arthur Olson have been commissioned to design and produce an "installation that builds installations" for the TED 2012 Conference in Long Beach CA. "Self-Assembly Line: from chaos to order and back" will be presented Feb. 27th-March 2nd at TED 2012. 02.17.2012 - Skylar Tibbits will be giving a workshop at the Metals in Construction 2012 Facades Conference, NY Feb 17th. 01.16.2012 - Skylar Tibbits will be giving a workshop at the Architectural Association's Emergent Technologies & Design Program, London January 16th-17th. 01.09.2012 - Skylar Tibbits will be giving a workshop titled, "Human Automata & Computational Construction" at The Bartlett, University College London, January 9th-13th. Sydney, Sao Paulo, New York, London and Berlin. 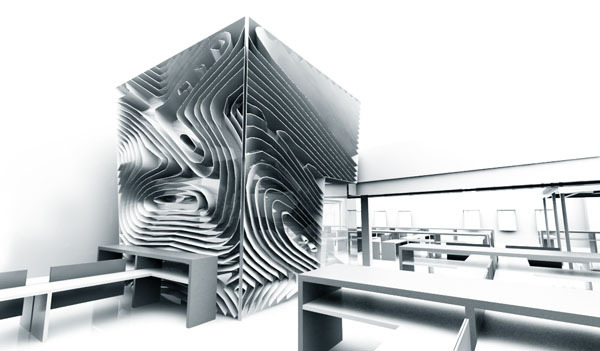 11.30.2011 - SJET and RadLab Inc have recently completed a collaboration and consultancy for the design of two office pavilions for OLS's MA headquarters. 10.25.2011 - Skylar Tibbits has been selected as a 2012 TED Senior Fellow and will complete a 2 year fellowship! 10.29.2011 - Skylar Tibbits will be holding a "Coding for Designers - Python for Rhino Webinar", October 29th. The webinar has limited enrollment - Sign up here! 10.25.2011 - Skylar Tibbits and Jared Laucks have completed the first of 5 trophies for GE and SEED Media Group's Data Visualization Marathons happening around the world. 10.11.2011 - Skylar Tibbits will be presenting a paper and teaching a Rhino/Python workshop, sponsored by Robert McNeel & Associates, at ACADIA 2011. Paper titled, "A Model for Intelligence of Large-Scale Self-Assembly". 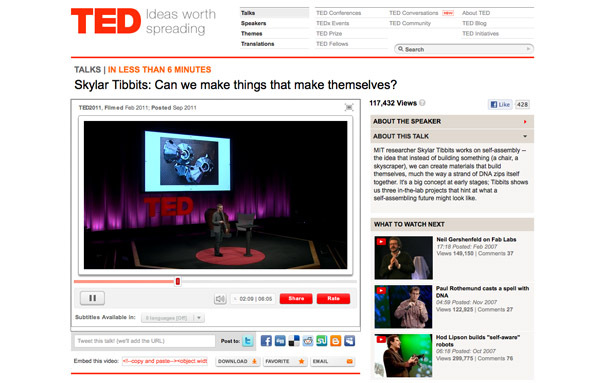 09.01.2011 - Skylar Tibbits' presentation at TED Long Beach has been posted on TED.com. 07.25.2011 - Skylar Tibbits and Jared Laucks have won the commission to design and produce 5 trophies/design objects for GE and SEED Media Group's Data Visualization Marathons in: Sydney, New York, Sao Paulo, London and Berlin. 07.25.2011 - Skylar Tibbits' TEDxBoston presentation, "When things build themselves", has been posted online. 07.22.2011 - Skylar Tibbits will be holding a Debut Python for Rhino 101 Webinar on July 22nd! Topics covered will include: Running Scripts, Syntax, Data Types, Variables, Flow Control, Tuples/Lists/Dictionaries. The Webinar has limited enrollment - Sign up here! 07.06.2011 - Skylar Tibbits, Jared Laucks, Matt Johnson and Paul Kassabian are selected finalists for the ZOO MIAMI Public Art RFP. 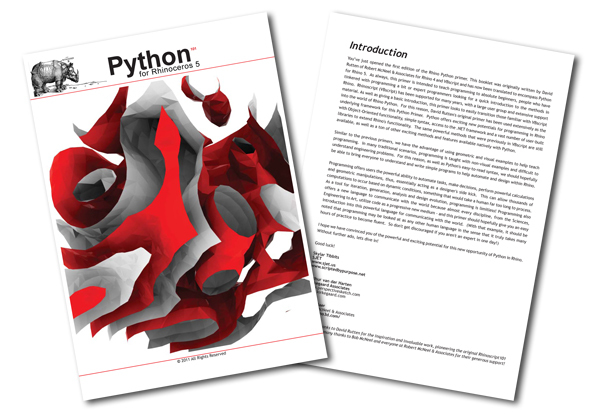 06.29.2011 - The Python for Rhino 101 PDF Primer has just been released! The Primer was co-authored by Skylar Tibbits, Arthur van der Harten, Steve Baer and original author David Rutten from Robert McNeel & Associates. Download Free here! 06.28.2011 - Skylar Tibbits will be presenting at TEDxBoston June 28th at the Seaport World Trade Center, Boston. 06.15.2011 - Skylar Tibbits, Jared Laucks, Murat Mutlu, Matt Johnson and Paul Kassabian are selected finalists for a Public Art RFP at the Orange County Airport, JWA Terminal. 06.09.2011 - Skylar Tibbits will be presenting at The Morning Line Opening and Symposium in Vienna - "Between Architecture, Science and Sound". 04.2011 - Skylar Tibbits has presented at the Forum on Future Cities, a conference discussing "pressing issues of urbanization and a wave of new distributed technologies." Hosted by MIT's Senseable Cities Lab and The Rockefeller Foundation, moderated panel by Adam Bly. 02.2011 - Skylar Tibbits has completed an experimental structure, voltaDom, for MIT's 150th anniversary celebration as the kick-off to the FAST Arts Festival (Festival of Art, Science and Technology) - directed by Tod Machover, Professor of Music and Media at MIT's Media Lab. See voltaDom for more information. 12.2010 - Skylar Tibbits has been named a TED Fellow for 2011 and presented at the TED conference in Long Beach, CA. Skylar has also been named one of the "5 Most Interesting New TED Fellows" by Fast Company. 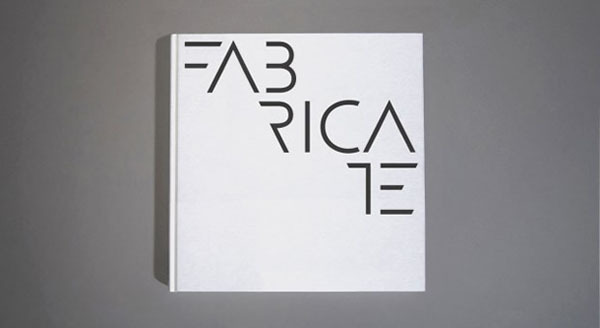 12.2010 - Skylar Tibbits will present at FABRICATE, an International Peer Reviewed Conference and Publication at The Building Centre in London, April 2011. 12.2010 - Skylar Tibbits has been selected to design and construct a 1:1 installation/pavilion structure for MIT's 150 anniversary celebartion: Festival of Art, Science and Technology. 12.2010 - Skylar Tibbits has been commissioned by SEED Media Group and GE to design the winning trophy for the Visualizing Marathon 2010, held at Eyebeam NY to launch their new website - Visualizing.org. See DataViz Trophy. 12.14.2010 - Skylar Tibbits will be giving a lecture and teaching a Rhino/Python workshop with Steffen Reichert at the Institute for Computational Design, Stuttgart, Germany on Dec. 14th 2010. Invitation by Achim Menges and Steffen Reichert. 11.2010 - Skylar Tibbits has been invited to collaborate with de|co design collaborative as a computational consultant for a Biotechnology R&D campus in Shenzhen, China. 11.03.2010 - Skylar Tibbits will be giving a lecture at Wentworth Institute of Technology's Department of Architecture on Nov. 03 2010. 09.01.2010 - Skylar Tibbits has accepted a position at MIT as a lecturer in the Department of Architecture, teaching a graduate design studio and seminar. 06.04.2010 - Skylar Tibbits has completed his graduate studies at MIT with a dual degree: MS Computer Science + MS Design/Computation. 04.23.2010 - Skylar Tibbits will be presenting at the closing event of Contemplating the Void: Interventions in the Guggenheim Museum. Hosted by the Center for Architecture NY and the Guggenheim NY, April 23rd @ 6pm. Invitation by David van der Leer, Assistant Curator of Architecture and Design. 03.25.2010 - THEVERYMANY(Marc Fornes, Skylar Tibbits, Mat Staudt, Jared Laucks) will be exhibiting work at the Synesthesie Galerie- Paris, France. 02.13.2010 - THEVERYMANY(Marc Fornes, Skylar Tibbits) will be exhibiting work at the Guggenheim Museum, NY for the Contemplating the Void exhibition, February 13th - May 12th. Invitation from David van der Leer, Assistant Curator of Architecture and Design. See Along the Void.